While still only 27 years-old, it’s easy to see how Warrick has risen to the top of his field so quickly. It’s difficult to recall ever meeting anyone so singularly passionate. “It’s all I’ve ever wanted to do. It’s my only thing, you know? It was never an option that there would be anything else. I just wanted to do puppets, and had blind faith that it was going to happen. 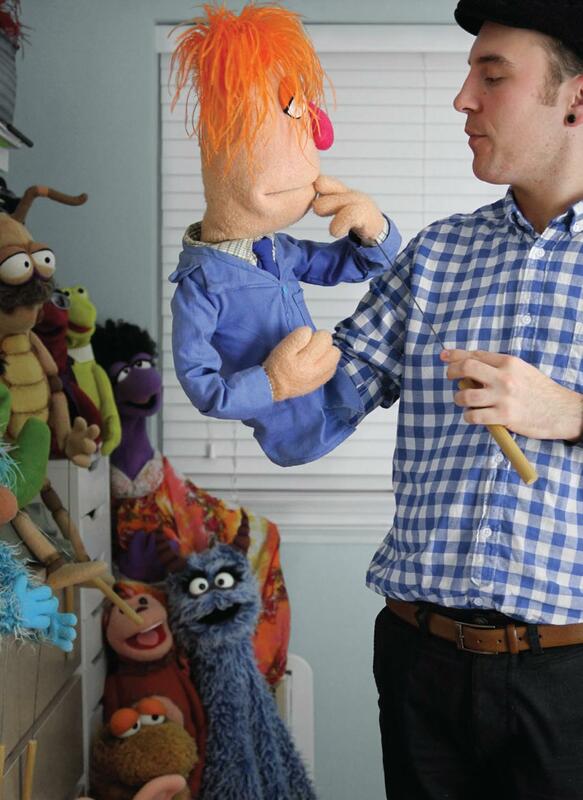 I didn’t go to college or university because there are no puppets in college or university.” As if to prove his point, every inch of Warrick’s workshop is covered with puppets, designs for puppets, and books on puppetry. “When I was young, I never consciously had to think ‘Oh, I must put in some time today’. When I was doing other things I wanted to go back to doing it. Anything else was a chore.” As he talks, Warrick still can’t help himself, picking up puppets again and again to demonstrate his points. Even when he’s not holding one, Warrick uses his gift for mimicry to leap into the voices of the people he’s talking about, from co-workers to the Queen (whom he once performed privately for). Working primarily for CBBC, Warrick now finds himself in a strange position where the performers he idolised as a child are his peers. “Ed the Duck was our boss. She’s gone from performing that character to being in charge of the whole department.” Puppetry is a small world, but an open one; Warrick’s met almost everyone in the industry at least twice; once as an awestruck child and again as a peer. On his first job (performing the hands of pop song-singing rats for a show called Space Pirates) he found himself working alongside the original performer of Otis the Aardvark, who had once called him as a child to offer encouragement. His heroes never seem more than a heartfelt letter away: during a chat about full-body puppet costumes, Warrick mentions that he once wrote to Carol Spinney, the man who has performed Big Bird for 43 years. Later he brings out Carol’s reply: the letter, written on paper the colour of a large avian, features a drawing of Big Bird hugging a puppet which Warrick designed himself. The spirit of the Muppets is an open-hearted one, and it’s been clearly absorbed by Warrick. It’s easy to imagine him writing the same sort of letter to a young fan. A slightly different version of this was published in Oh Comely Issue Fourteen. Photograph by Des Tan. To read the original article click here.